The labels and price tags on retail goods all over the world are often the product of one company: Avery Dennison, a $6.3 billion global behemoth whose inventory tracking, labels and packaging are integral to sales of goods such as apparel and footwear. The company has been honing a focus on sustainability, just last week announcing two bio-based polyethylene label films, which the company says are likely the first self-adhesive labels of their kind made from paper stock that is at least 80 percent renewable content. In addition to boosting Avery Dennison’s own environmental goals, the labels offer consumer product manufacturers a better chance at meeting their own targets on the use of renewable resources in packaging. The bio-based labels are also just one piece of an ambitious set of recently announced 2025 sustainability goals for the company. They include a plan to nearly eliminate waste to landfill, going 95 percent landfill free, and reuse 75 of what was once regarded as waste in new ways — a nod to growing corporate emphasis on material reuse in the push for a circular economy. Another goal is to reduce green house gas emissions by 3 percent each year in absolute terms — by adopting the “3% Solution” developed by the World Wildlife Fund, CDP and McKinsey & Co as what business should do for the world as a whole to keep global warming below a rise of 2 degrees Celsius. Within a decade then, Avery Dennison expects to have reduced emissions by 26 percent and will do so partly by switching to renewable energy sources in some operations. And very important, given its prominent label and packaging operations, Avery Dennison also committed to source its paper pulp from 100 percent certified sources — meaning from timber and pulp companies that practice certified sustainable forestry. The company said 70 percent will be paper certified by the Forest Stewardship Council. Similarly with chemicals, it aims to reach a point where 70 percent of the chemicals it uses are environmentally friendly or not harmful. Behind these ambitious sustainability goals and indeed pushing Avery Dennison to be a voice in the sustainability movement within the apparel and footwear industry is Helen Sahi, senior director of sustainability for Avery Dennison’s Retail Branding and Information Solutions division, a $1.6 billion business. RBIS is the division that provides labels that allow inventory tracking and materials sourcing on so many clothes and footwear sold by retailers around the world. Sahi also heads up corporate sustainability within Avery Dennison, for which she identifies sustainability challenges and prioritizes the corporation’s work on those challenges. She also heads up Avery Dennison’s sustainability partnership with the Rainforest Alliance. 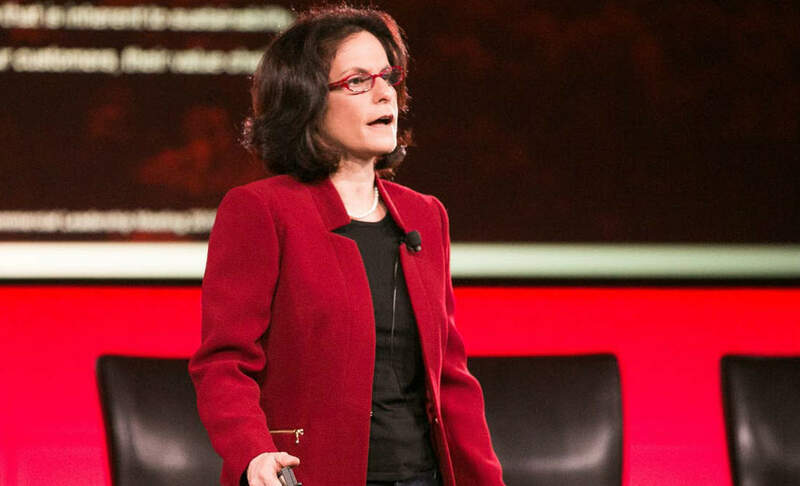 GreenBiz had a chance to talk with Helen Sahi recently about her work at Avery Denison, her career and industry sustainability issues. What follows is our conversation, lightly edited for clarity. GreenBiz Senior Writer Barbara Grady: It appears that Avery Dennison’s work in sustainability went into high gear in 2011, which is the year you arrived. Were you hired to lead this charge? Helen Sahi: Sustainability has really been core to who we are at Avery Dennison. Our founding members thought we could do more good running a good business than starting a non-profit. But even though it’s been core for 80 years, there wasn’t a sustainability team formed until about 2009. I was hired in 2011 to lead sustainability strategy within one of our business units, Retail Branding and Information Solutions. And just over two years ago I was also asked by the CEO to lead the sustainability efforts from the corporate level, so I wear two hats. At that time, we had a corporate sustainability team and some of our 2015 goals were already in place. When I joined the company in 2011, I found that although we were doing some good things within our operations and in our supply chain, we weren’t part of the larger conversation around sustainability in the apparel and footwear industry. When I looked outside of the organization, I found the Sustainable Apparel Coalition and knew that was where we needed to be. I reached out to the SAC. Grady: How did you get involved in sustainability work? Sahi: I was in college studying geology when one of my professors alerted me to opportunities in a new business: environmental assessment and remediation. So I took some courses in soil science and chemistry and when I went looking for a job, I applied to environmental consulting companies. I started in consulting, overseeing the drilling of wells and soil sampling, collecting samples and doing what is known as environmental site assessments where you did background research to see if companies had spills, issues with leaking underground tanks and things like that. I had always been a kid that wanted to do something bigger than me, something outside of myself to help make a difference in the world. So hopefully I’ve done a little of that. Grady: What prepared you for this career? Sahi: The best preparation was real life experience, everything from getting to visit sites where you could see the causes of environmental contamination first hand to being able to work within the financial world where you could see what the financial and reputational implications were in many sectors. I went from working at a consulting company to working at a manufacturing company where I did similar things, environmental assessments and remediation but this time it was for the company I worked for. From there, I went into banking in 1992 when (the U.S.) was in the midst of the savings and loan crisis and banks had portfolios of contaminated real estate they needed evaluated and sometimes cleaned up before they could disposition out of their portfolio. I was in banking for 17 years and the role evolved from an environmental assessment role to one that is today considered more sustainability oriented — where we started to look at the health of our buildings, indoor air quality, asbestos, underground storage tanks. Then we started to look at our own GHG emissions. We reported to the CDP and were also a signatory on the CDP request as an investor. With that we looked at GHG emissions in the investor owned utility portfolio, working with outside organizations like UNEP FI (United Nations Environment Program Finance Initiative) and the Environmental Bankers Association. Grady: What have been your major accomplishments at Avery Dennison, and the company’s major accomplishments, in sustainability? Sahi: The biggest accomplishment has been in assisting the company to develop its 2025 sustainability goals, which are science and context based. I am really proud of the fact that Avery Dennison is looking at the greater picture and being bold about its goals — we’re not just looking at incremental movement. Our GHG reduction goal is based on the “3% Solution” published by WWF and CDP; our paper goal addresses the need for certified paper and our guiding principles as we develop products and solutions are grounded in The Natural Step and the Future Fit Business Benchmarks. As I mentioned, some of our 2015 goals were in place before I started with the company, and those goals expire at the end of this year. So, about a year and a half ago, we started developing our news goals. I am really proud of the fact that Avery Dennison is looking at the greater picture and being bold about its goals — we’re not just looking at incremental movement. Grady: How did you build consensus around action at the company? Sahi: Gaining internal alignment and commitment is a core element of the Avery Dennison culture. I had lots of conversations. We did phone interviews at the start of the process. Then we had an in-person workshop, conference calls and lots of emails. The key was that we involved many people from the entire organization and not just the executives, but key stakeholders throughout the company. I think the challenge is keeping the momentum going. But to that end, we set up a Sustainability Council that is chaired by our COO, Mitch Butier. It certainly helped that we had the CEO’s and COO’s full support throughout the entire process. In February, we had a leadership meeting where our goals were announced. Just recently, we published our sustainability report that includes not only our progress toward our 2015 goals but includes our 2025 as well. Grady: Was it difficult to garner all that support? Sahi: I wouldn’t say it was difficult; it may have been challenging at times since anytime you have so many people involved in a process like this, you’ll have different viewpoints. 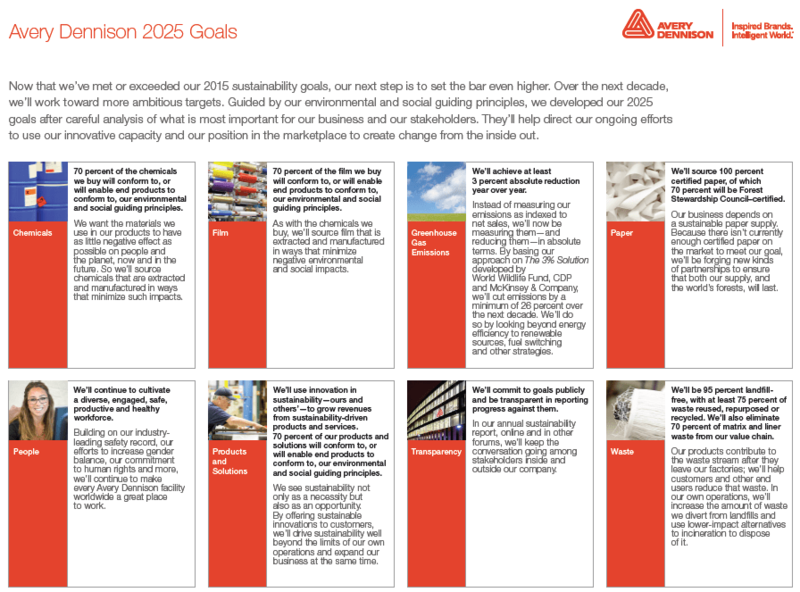 The process took about 10 months and, that may seem long, but by having the dialogue around the goals and around what’s important to Avery Dennison and the world, we were able to achieve alignment. Some goals may be harder to achieve than others, and we realize that, but we have some really smart people working at Avery Dennison and we are starting to figure out what needs to happen next. I think there was a bit of nervousness on everyone’s part, including mine when you put out goals that you don’t know exactly how you’ll achieve them but that’s what leadership is all about and we have great leadership. Grady: Within consumer goods industries, including apparel and footwear, there’s been increasing discussion about including the contents of a product, especially chemicals, on a product’s label. Avery Dennison has been involved in these discussions. What is the company’s position? 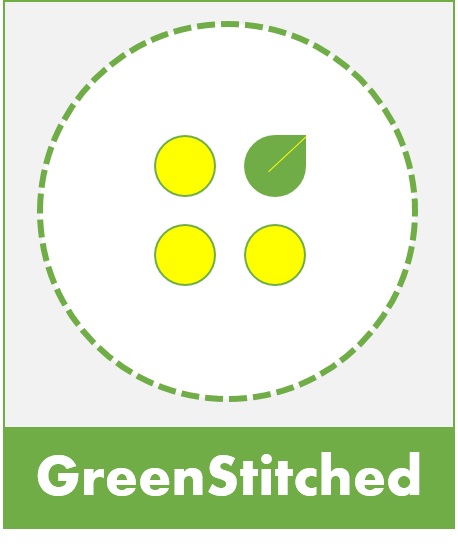 Sahi: We have been involved with the Sustainable Apparel Coalition since 2011 and a lot of the work that is being done there includes work around how you incorporate not only what is in a garment but from where. For example, there is a facility environmental module and as a manufacturer, we need to report on such things as energy reduction measures, wastewater handling, indoor air quality and other environmental factors. Grady: What are your thoughts about the upcoming United Nations Climate Conference coming up in Paris, the COP 21 Conference of Parties? Will Avery Dennison be participating? Sahi: Our CEO, Dean Scarborough, will be speaking at UNEP’s (United Nations Environmental Program) Sustainable Innovation Forum and a number of other folks from our business units will be there including myself. We committed to reduce our GHG emissions by 3 percent year-over-year over the next 10 years and I think it’s important that we get the word out that there are companies committing to aggressive goals and, more importantly, that we need others to follow. And, we’re looking to be part of the conversation as the world moves to a post-carbon future. Grady: What do you hope is achieved at these meetings? Sahi: A couple of things. One, I know it will be a great learning experience — these events always are. There are some companies out there doing some great things with respect to GHG reduction and we can all learn from each other. And, as I mentioned, I think it’s important to get the word out that all segments of society can do their part in reducing GHG emissions, from businesses to governments and civil society. This entry was posted in Conversations and tagged Avery Dennison, GreenBiz, Helen Sahi.